This Persistence Market Research (PMR) report examines the “Global Facial Rejuvenation Market’ for the period 2018–2026”. The primary objective of the report is to offer updates and information related to market opportunities in the global facial rejuvenation market. This report covers the global facial rejuvenation market performance in terms of revenue contribution from various segments. The report begins with an overview and market definitions. The market viewpoint section underlines the macro-economic factors influencing the growth of the global facial rejuvenation market along with detailing the opportunity analysis of the market. This is then followed by the key drivers, restraints and trends of the global facial rejuvenation market. By product type, the global facial rejuvenation market is segmented into topical products, botulinum products, dermal fillers, chemical peels, micro abrasion equipment and equipment. The botulinum products is expected to be the dominant segment in the global facial rejuvenation market due to their instant result and higher efficacy in facial rejuvenation. The adoption of botulinum products for facial rejuvenation is high in North America and Europe due to easy availability and comparatively high spending on skincare products and procedures. Whereas, chemical peels for facial rejuvenation are mostly adopted in Asia-Pacific and Middle East & Africa. By end users, the global facial rejuvenation market is segmented into hospital, dermatology clinics and beauty centers and spa. By region, the global facial rejuvenation market has been segmented into North America (the U.S. & Canada), Latin America (Brazil, Mexico, and Rest of Latin America), Europe (Germany, France, the U.K., Italy, Spain, Russia and Rest of Europe), Asia Pacific (China, India, Japan, Australia & New Zealand and Rest of Asia Pacific), and Middle East and Africa (GCC Countries, South Africa, Israel and Rest of MEA). A detailed analysis has been provided for each region in terms of facial rejuvenation market size, Y-o-Y growth rate, absolute $ opportunity, and attractive index. The forecast of the facial rejuvenation market by country, product type and end user is represented in a tabular form. This section will help to understand the present scenario and opportunity of the facial rejuvenation market in major countries by each segment. In the next section of the report, the “Competitive Landscape” is included to provide report audiences with a dashboard view of the key competitor firms in order to access the key differentiators among the competitor firms. This section is primarily designed to provide clients with an objective and detailed comparative assessment of product offerings and strategies of key providers specific to a segment. The detailed profiles of players operating in the facial rejuvenation market are also provided in the report, which highlight company description, product/segment overview, SWOT analysis, financial information, key developments related to the facial rejuvenation market and the strategic overview. The next section of the report highlights the facial rejuvenation market outlook for 2018–2026 and sets the forecast within the context of the facial rejuvenation market by region. The above sections – by product type and end user – evaluate the historic market analysis and growth prospects of the facial rejuvenation market for the period 2018–2026. We have considered 2017 as the base year and provided data for the forecast period. The final section of the report represents the global scenario of the facial rejuvenation market along with y-o-y growth and market forecast till 2026. This section also evaluates the global facial rejuvenation market opportunity over the forecast period as well as the absolute dollar opportunity for each year. This section will help to understand the overall market growth for facial rejuvenation and the opportunity analysis for every year over the forecast period. To arrive at the facial rejuvenation market size, bottom-up approach is used to validate the total market size obtained for the facial rejuvenation market. The forecast presented in the report provides total revenue of the facial rejuvenation market over 2018–2026. PMR uses the triangulation methodology, which is primarily based on experimental techniques such as patient-level data to obtain precise market estimations for the facial rejuvenation market and insights on specific country/regions. The country-specific data is again analyzed to derive data at a regional level and then at a global level. This methodology ensures high quality and accuracy of information. The factors considered while developing the estimates of the facial rejuvenation market are epidemiology, treatment seeking rate, ratio of population prescribed with different facial rejuvenation. On the other hand PMR has also analyzed the facial rejuvenation market by considering the revenue from the key players operating in the market. The key players are segmented at a Tier-level with respect to their revenues, product portfolio and geographical presence. This process involves analysis of annual reports of various companies, investor presentations, SEC filings, 10k reports, earning call transcripts and press releases. This task is done to fetch substantial information about the key players, their respective revenues and estimate their respective market share. The revenue growth of the key players in facial rejuvenation market is analyzed over the historical period and qualitative assessment of new product launches and innovations has been made in order to validate and align the resultant facial rejuvenation market numbers. The market structure is closely studied and analyzed at a regional level to map and ascertain incremental $ opportunity for companies, for instance, supply from domestic/regional players, small-scale enterprises or unorganized segments is also taken into consideration to arrive at the final market numbers. While forecasting the market size for the facial rejuvenation market, we have considered the impact of several factors such as per capital healthcare expenditure, disposable income, new facial rejuvenation products and approvals for new advanced facial rejuvenation products, penetration of facial rejuvenation products to various end users, and generic penetration across all regions, among others. However, quantifying the facial rejuvenation market across the aforementioned segments and regions is more a matter of quantifying expectations and identifying opportunities rather than rationalizing them after the forecast has been completed. In addition, we have taken into consideration the year-on-year growth to understand the predictability of the facial rejuvenation market and to identify the right growth opportunities in the global facial rejuvenation market. Geographically, the global facial rejuvenation market is expected to be dominated by North America due to increasing number of non-surgical aesthetic procedures and higher adoption of advanced facial rejuvenation products. The growing number of procedures, increasing aging and mid-aged population coupled with increasing spending on facial rejuvenation products are the other factors expected to fuel the growth of the facial rejuvenation market in the region. The U.S. is expected to be the most lucrative market for facial rejuvenation in North America. According to the American Society of Plastic Surgeons, more than 14.2 million cosmetic minimally invasive procedures were performed in 2015 in the U.S. Their low cost as compared to surgical procedures is also a factor expected to increase their adoption. 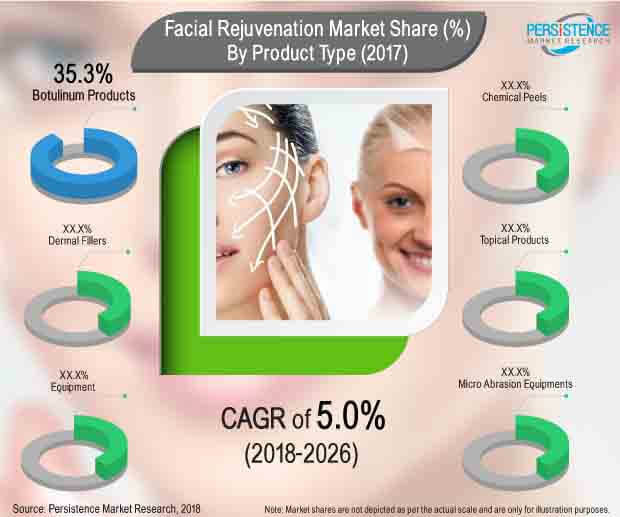 Higher penetration of facial rejuvenation products for age defying and youthful look coupled with increasing number of aesthetic procedures is expected to drive the growth of the U.S. facial rejuvenation market over the forecast period. Europe is expected to be second leading regional market for facial rejuvenation due to increasing number of non-invasive or minimum invasive procedures as well as rapidly aging and large mid-aged population. Usually, surgical procedures are used for facial rejuvenation, but from the last couple of decades the adoption of non-surgical facial rejuvenation procedures has increased at a significant rate due to their relatively low cost. Besides, extended efforts are been made by various facial rejuvenation product manufacturers to increase their market footprint by undergoing collaborations, partnerships, and acquisitions with different local facial rejuvenation product manufacturers, e.g., Merz and Teijin signed a partnership agreement to Bring Xeomin (incobotulinumtoxin A) to Japan in 2017. In terms of revenue share, Latin America, Asia-Pacific and Middle East & Africa stand at the third, fourth and fifth place, respectively, in the global facial rejuvenation market. With high revenue share, North America is expected to be the fast-growing regional market due to higher adoption of facial rejuvenation products, increased spending on cosmetic procedures, and presence of leading facial rejuvenation product manufacturers. North America was the first region to introduce regulations for cosmetics- and aesthetic-related procedures. The global facial rejuvenation market is expected to expand at a CAGR of 5.0% over the forecast period 2018–2026. The global facial rejuvenation market is expected to be dominated by North America with 39.0% market share in 2018 and 43.3% market share by the end of 2026. The North America facial rejuvenation market is expected to represent a high absolute opportunity of US$ 596.6 Mn in 2018 over 2017. Introduction of various non-surgical procedures to treat early aging, wrinkles, nasal folds, glabellar lines, forehead lines and volume loss in lower face with instant results is expected to drive the growth of the global facial rejuvenation market over the forecast period. Various manufacturers are making efforts to increase their market footprint specially that of advanced facial rejuvenation products such as botulinum products, dermal fillers in Asia-Pacific, Latin America and Middle East & Africa, which is also expected to enhance the growth of the global facial rejuvenation market. Latin America is expected to follow North America in the global facial rejuvenation market. Latin America experienced the drastic surge in the number of facial rejuvenation procedures performed in 2013 and 2014, owing to which it has experienced steady growth. The dramatic surge in the non-invasive surgical procedures was due to increased product reach, availability of skilled personnel and availability of advanced facial rejuvenation options. Asia-Pacific is expected to grow at a CAGR of 4.5% over the forecast period. Chemical peels were rationally used in Asia Pacific as an effective option for facial rejuvenation but increasing availability of products such as botulinum and dermal fillers, which are efficient and provide instant results, is a factor expected to drive the growth of the facial rejuvenation market in the region. Currently, botulinum products and dermal fillers are the most prominent types of products used for facial rejuvenation due to their high-end efficacy and instant results. Increasing use of lased-based equipment for permanent facial hair removal and minimizing skin pigmentation is also expected to drive the growth of the facial rejuvenation market. Facial rejuvenation procedure with botulinum products and dermal fillers in combination for enhanced results is expected to contribute to the growth of the market for facial rejuvenation. Growing trend of medical tourism in regions such as Latin America and Asia-Pacific is the other factor expected to contribute to the growth of the facial rejuvenation market.